The BMW X5 – the founder of the Sports Activity Vehicle segment and globally best-selling car in its class, with more than 1.3 million units sold since the launch of the first generation – is entering a new chapter in its successful history. The third-generation X5 sees BMW once again setting the benchmark for powerful design, interior spaciousness and luxury, versatility, driving pleasure, efficiency and innovative equipment features. The new BMW X5 offers customers an assured all-round package equipped to meet the most exacting and varied demands. 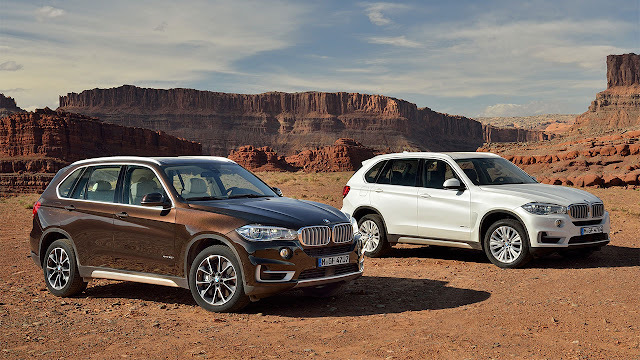 BMW coined the phrase ‘Sports Activity Vehicle’ because it perfectly summarises the character of the X5 – a car with the all-roads, all-weather capabilities and the space and versatility of an SUV, with the driving enjoyment of a BMW. Those qualities are further advanced with the TwinPower Turbo engines, standard eight-speed automatic transmission and suspension personalisation options of the new model. At the same time these are accompanied by significant reductions in fuel consumption and CO2 emissions as a result of a raft of EfficientDynamics technologies. All engines already meet the EU6 emissions standard not due to be introduced until September 2014. In the diesels this is due to a combination of a nitrogen oxide (NOx) absorber catalyst, Selective Catalytic Reduction and a urea (AdBlue) injection which turns the vast majority of NOx in the exhaust stream into harmless nitrogen and water. The range will initially be made up of the xDrive30d, M50d and xDrive50i, available from November 2013. The 3.0-litre six-cylinder xDrive30d is 19 per cent more fuel efficient, with economy improved by 7.4mpg and CO2 reduced by 33g/km – despite power and torque increases of 13hp and 20Nm. The M50d, powered by a three-stage single turbo version of the 3.0-litre six-cylinder engine, is 12 per cent more efficient. Consumption is reduced by 4.5mpg and CO2 emissions down by 22g/km, while maintaining its high power and torque outputs. The xDrive50i has a new-generation 4.4-litre V8 engine now incorporating VALVETRONIC variable valve timing as well as twin turbochargers. Power is improved by 10 per cent (41hp) and there has been a 50Nm increase in torque, but consumption falls by 20 per cent (4.6mpg) and CO2 emissions have been cut by 50g/km compared with the previous engine. These three engines will be joined at the end of the year by a four-cylinder diesel – taking advantage of the new X5’s considerably reduced weight and another six-cylinder diesel. 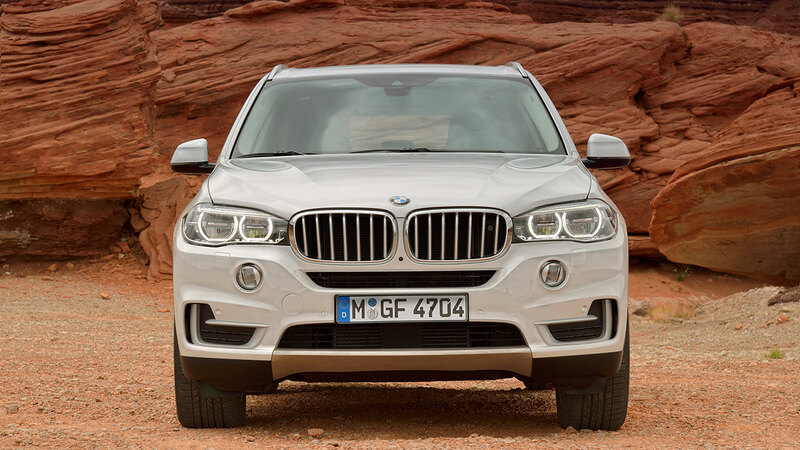 The 2.0-litre four-cylinder turbodiesel engine is new to the X5 and appears in the sole two-wheel drive model, the sDrive25d, and the xDrive25d, which provisionally achieve fuel economy of 50.4mpg and 47.9mpg respectively. The respective provisional CO2 figures are 149g/km and 155g/km. The xDrive40d, with a twin-turbo 3.0-litre in-line six-cylinder diesel engine, is expected to have average fuel consumption of 44.1mpg with CO2 emissions of 169g/km. All versions come with an eight-speed automatic transmission which not only adds to driving enjoyment but also makes its own contribution to fuel-saving. The ECO PRO mode adapts the engine management, accelerator response and transmission characteristics to support a particularly fuel-efficient driving style, and even programmes the climate control and heated seats and mirrors for the most efficient use of energy. In conjunction with the standard BMW Professional Multimedia navigation system, it can even advise the driver to ease off the accelerator when approaching corners or lower speed limit areas through the Proactive Driving Assistant function. This also helps to lower fuel consumption. 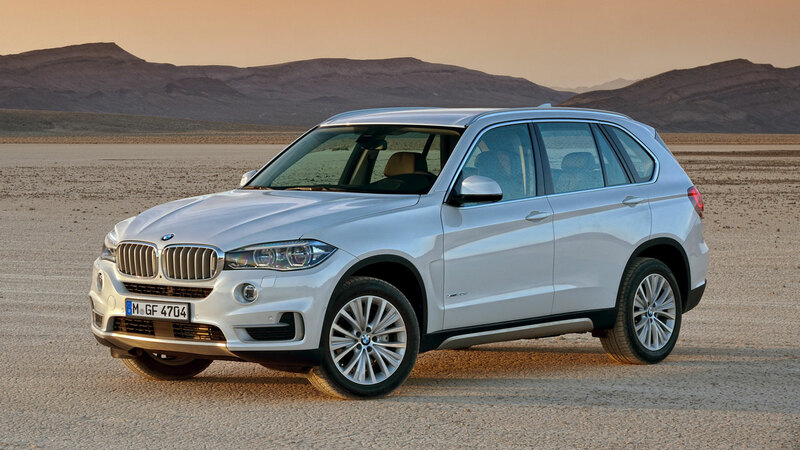 The new BMW X5 is equipped with a raft of EfficientDynamics features which complement the new engine line-up and standard eight-speed automatic transmission to keep fuel consumption and emissions to a minimum. They are joined in the new model by extensive weight and drag-reduction measures, making the new X5 the lightest and most aerodynamic car in its class. The X5 is fitted as standard with ECO PRO, Auto Start-Stop, Brake Energy Regeneration, on-demand use of auxiliary units, electric power steering and low rolling resistance tyres. Extensive use of ultra-high-tensile steels in the body structure, an aluminium bonnet and magnesium instrument panel support and thermoplastic side panels have reduced the weight of the X5 compared with the previous model, with the xDrive30d weighing just 2,145kg. The car’s drag co-efficient (Cd) has meanwhile been reduced to as low as 0.31 (xDrive30d) thanks to active upper and lower air flaps in the front air intakes, air deflectors on the front wheel arches and a range of detailed improvements. 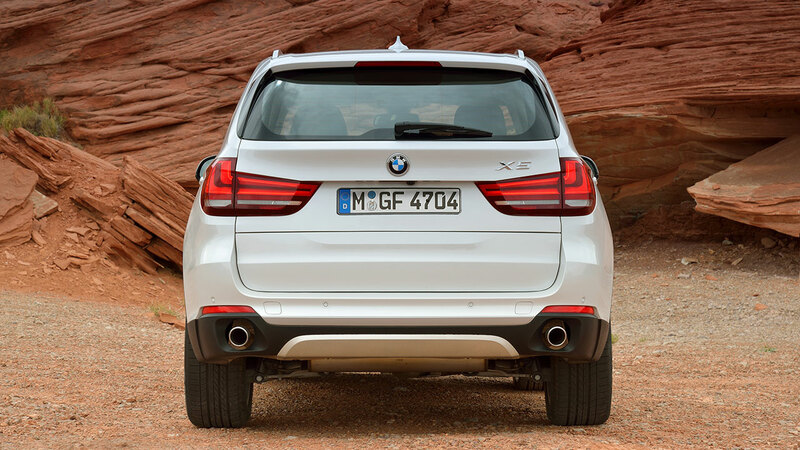 The new X5 becomes the first BMW X model to feature vertical Aero Curtains and Air Breathers, which ensure that air passes over the wheels with the minimum of disturbance, and Air Blades, which work with the rear spoiler to smooth airflow around the car. 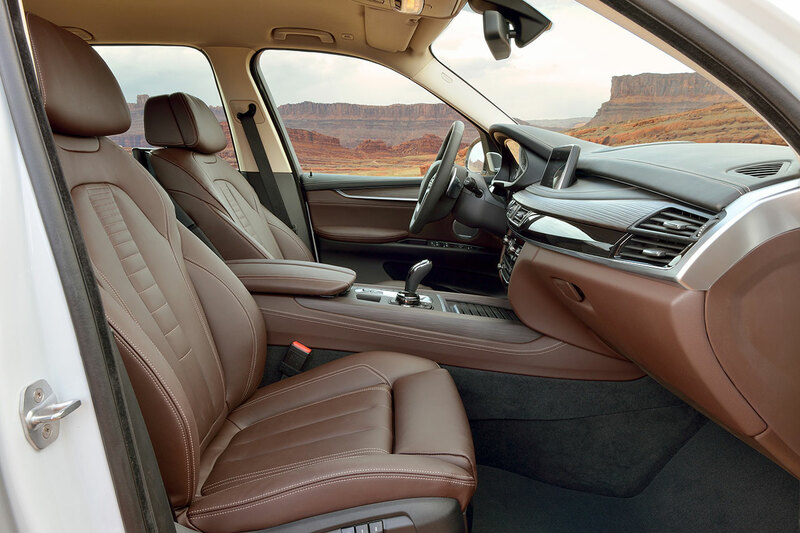 The new BMW X5 comes as standard with a Drive Dynamic Control switch, allowing the driver to fine-tune the balance between comfort and sportiness on and off-road. The Driving Experience Control switch adjusts accelerator response, the characteristics of the power-assisted steering, automatic transmission shifting and – depending on the choice of suspension – damping qualities and roll stabilisation. It is mounted in the centre console. In addition, there is a choice of four suspension packages to provide the ultimate in personalisation: Adaptive Comfort suspension, Adaptive M suspension, Adaptive Dynamic suspension and Adaptive Professional suspension. Adaptive Comfort suspension comprises Dynamic Damper Control and air springs with automatic self-levelling, and offers two damping modes selected via the Drive Dynamic Control switch. It is ideally suited to owners who will use the X5 on a variety of surfaces. Adaptive M Suspension is standard with the M Sport package and includes SPORT and SPORT+ modes for drivers who enjoy a more dynamic driving style. The Adaptive Dynamic suspension package provides significantly sportier cornering characteristics by optimising roll stabilisation and directional stability via Dynamic Performance Control and Dynamic Drive. The Adaptive Professional suspension delivers the best of all worlds by combining the qualities of the Comfort and Dynamic packages into an integrated system. All versions are equipped with electronic power-assisted steering. The X5 xDrive30d and xDrive50i are optionally available with Active Steering, which varies the level of assistance and adjusts the steering input required for any given manoeuvre. This reduces the steering effort needed when parking while guaranteeing maximum feedback for the driver at speed. All versions have an electromechanical parking brake and a powerful anti-lock braking system backed up by a vast array of driver assistance features – Dynamic Stability Control, Dynamic Traction Control, Cornering Brake Control, Dynamic Brake Control and an Automatic Differential Brake. Brake Assist, Brake Standby, Hill-Start Assistant, Brake Fade compensation, Brake Drying and Hill Descent Control (on xDrive versions) are also standard. The latest version of the BMW xDrive system, which intelligently manages the torque split between the front and rear wheels, has been enhanced for efficiency and now weighs 1.4kg less. It takes information about road and wheel speeds, steering angle and accelerator position to interpret the driver’s intentions and what the car is doing to calculate how to apportion engine torque. As a result it eliminates both understeer and oversteer to deliver improved cornering abilities. In combination with Dynamic Performance Control integrated into the rear differential, it can be even more finely controlled. It varies the drive split between the rear wheels – torque vectoring – for even further enhanced cornering capabilities and feedback. All-wheel-drive models now include a 3D xDrive display giving real-time details of body roll and pitch in the central information screen, as well as a digital compass display. The design of the new X5 is deliberately evolutionary – a modern and eye-catching update of the style which has made the car the global best-seller in its class – while the spacious interior with seats for up to seven people now offers even greater luxury and functionality. Signature exterior features are a short overhang, long wheelbase, upright A-pillars and a short distance between the front axle and the instrument panel. The forward-leaning and muscular kidney grille is set into a triangle between the three-dimensional twin circular headlights with LED elements, the LED foglamps and the X-shaped contours within the front bumper. Adaptive LED headlights are optional. The front apron has air intakes at its outer edges which emphasise the X5’s wide track and broad stance, while striking underbody protection elements are a nod to its robust and versatile nature. The sides are characterised by precise lines leading into a dynamic wedge shape and taut surfaces which create light and shade, reinforcing the dynamic qualities of the car. A shoulder line rises steadily from the headlight units through the door pulls and into the rear lights. A character line extending from the Air Breathers and a crease above the side skirts appear to stretch the side surfaces. Large windows give the interior a light and spacious feel. Horizontal lines on the split tailgate and rear apron accentuate the width of the car, and there are thin 3D strips within the L-shaped rear light units. The elegant and luxurious interior features a layered front panel with a horizontal structure and 3D surfacing, adding to the sensation of space. The high-quality materials include accent strips on the front and rear door panels and Oxide Silver dark matt, Poplar Grain fine wood or Aluminium Hexagon elements on top of a high-gloss black surface with a Pearl Grey Chrome underline. There is a 10.2 inch free-standing Control Display screen linked to the new iDrive Touch Controller operating system. The climate control and ventilation displays feature black-panel technology. In all models there are newly designed front seats with the option of comfort or sport seats. Heated comfort seats are now available for the second row. An Easy Entry function and a grip on the C-pillar make access to the rear simpler. The third-row seats can be lowered into the floor individually. The folding backrest in the middle row is now split 40:20:40 as standard for greater versatility. The BMW X5 offers a minimum of 650 litres of luggage space, and 1,870 litres – an increase of 30 litres with the seats up and 120 litres with them folded – in two-seat formation. There is increased storage space within the cabin, while the split tailgate includes automatic operation of the upper section as standard and, now, remote control closing as well as opening. The new X5 will offer two design packages as alternatives to the standard specification of SE and M Sport to allow maximum personalisation. They are called Design Pure Experience and Design Pure Excellence, and include a harmonious blend of design, colours and materials. The exterior and interior parts of these design packages can be ordered as a total package or independently and can be combined with standard specification or with each other. Design Pure Experience emphasises the X5’s robustness, and includes stylish brushed stainless steel underbody protection, kidney grille and air intake bars plus a Titanium effect rear trim strip. The exterior mirror bases and B and C-pillars are in high-gloss black and there is a Matt Aluminium trim around the side windows. The exhaust tailpipes have a Matt Chrome finish. Inside, there is Nappa leather with contrast stitching in dark Mocha and Black, Black leather on the instrument panel and upper arm trims with Nut Brown contrast stitching and an interior trim in Fineline Pure textured wood. The lower area of the instrument panel is in Mocha. The Design Pure Experience package costs from £1,760. Design Pure Excellence emphasises the X5’s elegance. The underbody protection and wheel arch surrounds are in body colour, while the kidney grille bars are Black with high-gloss Chrome fronts. There are T-shaped bars for the outer air intakes and louvres for the lower aperture, a Chrome strip adorns the rear apron and the side windows have Chrome Line Exterior trim. The mirror bases and B and C-pillars are in high-gloss Black. The Nappa leather interior features extensive areas in Ivory White with contrast stitching, American Oak interior trim and Atlas Grey leather instrument panel and door panel coverings with contrast stitching. The lower part of the instrument panel is in Ivory White. The Design Pure Excellence package costs from £1,160. 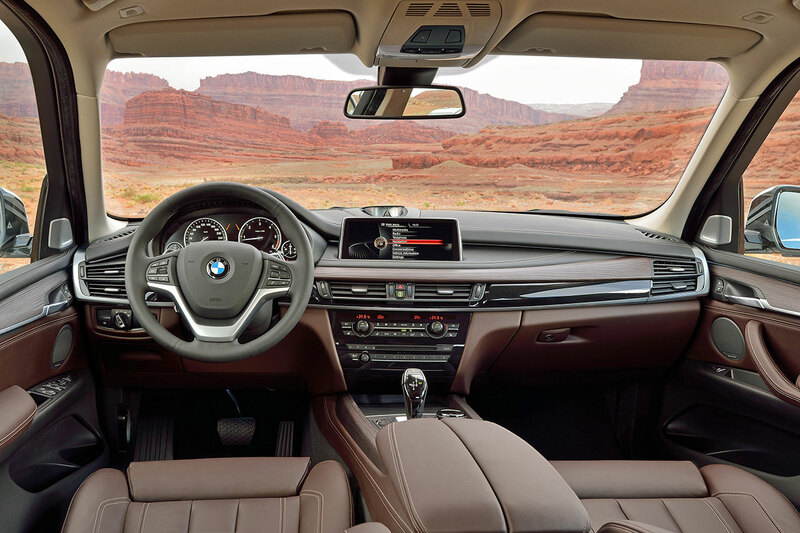 Innovations have been added to the BMW ConnectedDrive system to enhance the active safety, convenience and infotainment facilities of the new X5. The new Driving Assistant includes Lane Departure Warning and a pedestrian and collision warning system with braking function. This first alerts the driver to a potential accident, primes the brakes and then initiates moderate braking at speeds of up to 35mph. The Driving Assistant Plus package adds Active Cruise Control with Stop & Go to maintain a safe distance to vehicles ahead from around 19mph through a combination of a front-end camera and full-range radar sensors. It can brake the X5 to a standstill if necessary and will later this year include Traffic Jam Assistant to maintain the X5’s position in its lane at up to 25mph. Dynamic Safety adjusts the seat belts, front passenger seat, windows and sunroof (if fitted) to the optimum position to survive an accident, while Attention Assistant can sense possible driver fatigue and issue audible and visual alerts. There is also the standard BMW Emergency Call, which identifies the X5’s position after an accident and automatically advises the BMW Call Centre of the severity of the impact, the number of occupants and if any airbags were triggered. The Glare-free High-beam Assistant allows full beam to be maintained even when there are other vehicles approaching or immediately ahead by masking the portion of the light pattern which could blind other drivers. It is therefore easier for the X5 driver to see pedestrians, cyclists or unlit parked cars at the roadside. BMW Night Vision now detects not only pedestrians but also animals, and includes the Dynamic Light Spot to illuminate anything heat-radiating outside the headlight beam area. The BMW Parking Assistant (planned from late 2013) will identify suitable parking spaces and not only steer the X5 into them but also operate the accelerator and brake, while Surround-view gives the driver a 360-degree view of the outside of the car. There is also a new version of the BMW Head-Up Display which is able to put additional information on the windscreen, such as telephone contact lists, entertainment programmes, speed limit information and overtaking restrictions. The X5 is also available with Concierge Services to make hotel reservations or search for telephone numbers and addresses, while Real Time Traffic Information can guide the driver away from hold-ups on the chosen route. Internet access and Online Entertainment, giving access to 12 million music tracks, are available, while BMW Apps includes web radio, customised music programming and access to Facebook and Twitter. A Harman Kardon Surround Sound system and a Bang & Olufsen Advanced audio system are available. 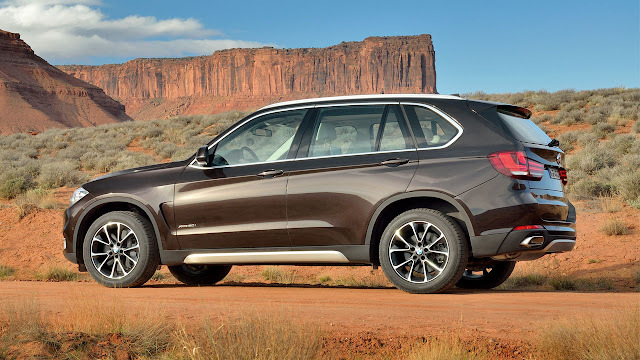 The new BMW X5 goes on sale on 16 November 2013 and will cost from £42,590 OTR*** for an sDrive25d SE and from £44,895 OTR*** as an xDrive25d SE.